Peggy Sue is a really small Jayco Pop Up Camper. We love her even though space is limited. Every square inch of space is used creatively to remain organized and not feel like we are living in a constant mess. Clutter can be a perpetual problem on multi night trips, but I feel like we manage pretty well. We have everything in a specific place. Here are some ideas to help you organize all of your stuff inside of your camper. I purchased a set of Sterilite Storage Drawers for our pop up camper to stow away our clothes. Each person gets 2 drawers to pack in. We manage to make this work. One reason I didn't purchase a larger drawer system is that we didn't have the space. These 3 drawer chests gave us just enough storage. I managed to find grey ones, but there are brown and white ones that look great too. You can find these at stores like Walmart and Target. Before you purchase anything, make sure to measure the width and depth of your cabinets or location where your items are going. This will ensure everything fits within your space. Also, some people opt for hanging storage. That is a great way to organize too. The main reason I chose storage drawers is that I can bring them in the night before a trip and easily pack them. It just made more sense to do it this way. Storage drawer systems for our clothes. We have two small draw systems that sit side by side. I love that they are grey and match our interior! Having a place to store food is important. I saw lots of posts about all of the systems people create for shelving. Maybe one day. But hanging storage works great for us as a pantry. I have some 3M hooks on the ceiling and have hung storage over the sink. I purchased this three shelve unit from Target for about $9. One thing I like about these is that they have a hard bottom to each self. They are sturdy and keep everything where I can easily locate items. And I can add drawers to these if I want. I probably will at some point. But for now this works. I do keep things like little single pack items that we have for snack in a basket to keep them from spilling out. Drawers are a little neater, so this will probably be a future purchase for us. I tend to buy things a little at a time for our camper so that it is a little easier on the wallet. Hanging storage is great for pantry items. They are easy to hang from the ceiling and hold quite a bit! I added a little dish organizer for a small set of dishes. It is easy to keep everything in one little place on the counter. I can even fold my place mats and keep everything together. Think vertical in a small space. It makes better use of horizontal spaces and is neat. My big dinner plates are on the bottom with the small plates in the middle and bowls on the top. My plastic cups are stacked and rest beside the dishes on the counter. However, I am considering a cup or mug stand that I can use to organize my plastic glasses. I love our dish organizer that keeps our dishes out of the way and in one neat tower! We use a collapsible dish drainer for dishes. At night (or when not in use), it fits over the sink. I stack my basket of pot holders and towels on top. Everything is confined to one tidy spot. I also use a drying mat under my drainer when I wash dishes. It is hung out to dry each day and washed when we return home. It is an easy system. This collapsible dish drainer is the perfect size to fit over my sink when I'm done with dishes. I have a little basket with dish towels, pot holders and wash clothes that I can stack on top of my drainer when I am done as well. I stocked our camper with a variety of baskets, bins and bowls. I stow them underneath my sink when they aren't being used. These all serve a purpose. My large bowl is used for storing fruit and placed on our table outside for us to eat while we are camping. I have a basket filled with towels and wash cloths. This is on top of our clothing storage boxes. A basket is used for our dog leash, food and other dog necessities. I even have a little basket on my counter for towels, dish cloths and pot holders. It just makes things seem like home and easy to put away and find when we need it. A basket of linens on top of my clothing storage keeps things going up and out of the way. My basket of towels and pot holders makes my space feel homey and keeps things organized. When I pull our bed back each morning after we get moving, I put things on the edges of our beds there that we need to get out of the way. This is where we store things like CPAP machines, totes with toys or even jackets. I just pull the bunk end curtain back part way. These items are out of the way and out of the floor! Store things you are not using on the edges of the bed and just close the bunk ends part way to keep them out of sight. CPAP Machine out of the way and put up! Toys are stored in a tote and placed behind the bunk end curtain. The key to keeping things organized is to plan for it. Look around your house. Locate bins, baskets and totes that you are not using. Re-purpose them for your camper. When you are camping, give each thing a space. And get into the habit of using those spaces. Put everything back when you are finished using it. You will be able to find your things and enjoy camping in a clutter free environment. We love Peggy Sue. She is super comfy at the end of the day. However, she is a lot more comfortable and enjoyable when things have a space for them to be stored and are not cluttering every surface. How do you organize your camper? There are so many ways to do this. I'd love to hear how other campers organize their spaces. I'm sure I could get some ideas from you! Feel free to contact me or comment below. Get out there and get organized before the camping season gets under way. You will enjoy camping so much more in a space where you can enjoy it when you get ready to sleep or come indoors. And it takes minimal effort if you are organized. Most campers, this time of year, are gearing up for warm weather and lots of fun trips. As you start to prepare for the upcoming camping season, don't forget to check, create or redo your shower kit and toiletries. I created a shower kit for our family that stays in our camper so that we are always ready. 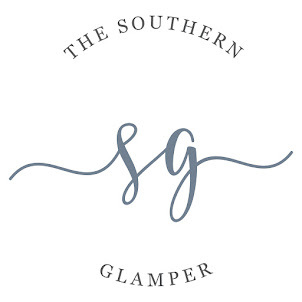 Even though I'm a certified glamper, I also believe in simple and easy. Our family toiletry kit for camping is no exception. I put together a kit that is easy to tote back and forth to the showers that ;everyone can use. I also didn't want to spend a ton on money on this kit. Clean and functional was my goal. Stores like Dollar Tree and Big Lots are great places to shop for your shower kit. These two stores are where I found most everything in our kit. These stores are cost effective and are full of handy items that are practical. Before you start shopping, take inventory of what you have at home. The brand name deodorants were $1 each at Dollar Tree! I used an extra hair brush I already had. Use what you have if there are duplicate items at home. I had quite a few things that were extras that I stashed into our kit. After you have inventoried what you have at home, make a list of what you need or just a master list to make sure you don't forget things you will need. Lists are underrated and serve a big purpose. When we took our first camping trip, I made a shower kit but forgot a hair brush. We made do, but our hair was a little wild. Make a list. Our shower kit is a plastic basket with a handle that I found at Dollar Tree. I actually purchased 3 of these baskets. One is for our toiletries. Another basket is used to hold our shower flip flops, and the third one is for dumping shoes into to keep from tracking up everything inside. It works pretty well. Best of all, if they get dirty, wet or something spills in them, I can hose these baskets out and dry them easily. These baskets were also at Dollar Tree. I have 3. One for our shower kit, one for flip flops and one for other shoes. Inside of our toiletry basket, I stuffed everything that we would use as a family. One kit is all we need. I didn't want to have every member with a different tote, bag or set of items. It is just too much for me to manage. Depending on the ages and genders of your children or even the size of your family, each member might mean their own kit. However, this works for our small family of three. Our shower kit has all of the basic items that we need for our trips. If you have toiletry items that you really love at home - shampoos and conditioners, then purchase those little travel bottles and fill with your favorite shampoos, conditioner, mouthwash,etc. I used a Brother P-touch Easy Hand-Held Label Maker (PT-H100) to label each bottle. Each one can be refilled easily. We didn't really need big bottles of shampoo, conditioner, etc. Travel bottles are easier for us to pack. Again this is going to depend on the size of your family and length of trips you take. Travel bottles are great and can be refilled over and over. I purchased these at Big Lots for $1.50! Another thing that I added to our kit was some homemade conditioner for me. I have been reading and learning quite a bit about natural products that can be made easily. I made a conditioner that is 1 part apple cider vinegar, 2 parts distilled water and 5 drops of lavender and 5 drops of mint essential oil. I LOVE it! My hair is really soft. My hair is typically oily but not with this conditioner. And it has become a favorite product on camping trips! It is in a spray bottle that came in my little travel bottles. I just spray it on my hair after I shower. Give it a try! I also found these little toothbrush kits at Big Lots that were $1 each! They had a toothbrush, toothbrush case and travel sized tube of toothpaste. I labeled each clear bag and made sure that each one of us have a different color brush to keep them separated. You could also ask you dentist for a toothbrush or a similar kit at your next visit or just call and request. Most dentist give these out at dental appointments and would probably be happy to give you a few toothbrushes for your camper! Toothbrush kits that I found at Big Lots were perfect! I'm a big believer in products that do double duty. If you are body wash user, then check out the Honest Company's body wash and shampoo. It is 1 product that does both. It is easy to use and lather's well. I like a shower puff when I bath, so I use this body wash while camping. However, my guys like bar soap. So, I have a bar of soap in a soap holder for them. Honest Company is a favorite brand and work great for our kit. I love the body wash and shampoo combo product and the body oil! Honest Company also makes a great body oil that is easy to apply, and I prefer it to lotion. This is another great product to have. You could even add a little essential oil to the bottle for a lavender scent at the end of the day. Other items that you need are flip flops. Walmart and Old Navy are both places that have inexpensive plastic or rubber flip flops for the shower. I purchased ours at Old Navy this year because they had their flip flops out sooner than other stores. A cheap pair will work just fine for this. Finally, I recommend getting a tote bag of some sort that just stays in your toiletry kit. Use it to place clean clothes in for taking to the shower. You could even stow a second tote for dirty clothes. Most people have these totes laying around. I have tons of them from conferences and events. I like a canvas or fabric tote bag because they last longer than grocery sacks and can be washed. If you are afraid your family will mix them up, label them with a sharpie marker - Dirty and Clean. A well thought out shower kit will keep you feeling clean and fresh while camping. And, it will keep you from trying to find a store if you are in remote locations. Plus, I just hate having to make do or make extra trips to the store while camping. It kind of spoils the fun for us. Plus, now that I have most everything in our camper, all we have to pack are clothes and food. It makes trips so much easier and fun. If you want a pre made list for your toiletry kit, you can access my toiletry starter list. Feel free to make it your own. And, if you want to use this list electronically on your phone, copy and paste your list into Google Keep. Make sure you have the app loaded onto your phone. This will make life a lot simpler. Feel free to contact me with questions about how to use Google Keep or about this post. 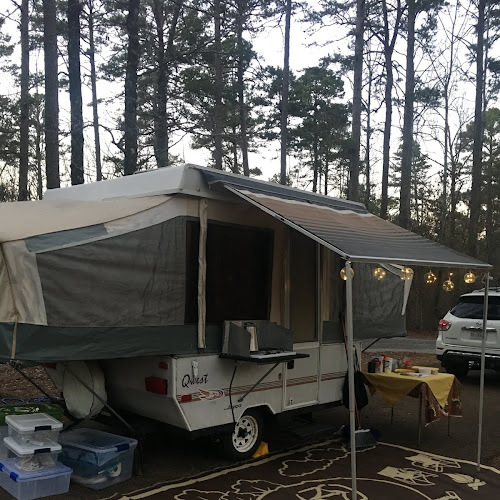 If you are looking for other lists and planning help for the spring and summer camping season, check out my Camping Lists and Menu Page. I also have pages devoted to Camping Gadgets and Gear as well as my Pop Up Camper Remodel Page. Feel free to comment about how you constructed your camping shower kit. What are some must have items in your kit? Now that the days are getting warmer and longer, camping season is here. Get ready for a great season of camping fun! I hope you will follow along. Sign up so you don't miss a post. It is easy to do! Thanks for taking time to stop by! Camping can be a lot of work. Camping meals can either add to that work or be easy and fun. I opt for the later. A little prep work at home can go a long way. And it is easier that one may think. This was one of my worries when we started camping. I'm a planner, and I wanted to plan good meals. This didn't include endless meals of hot dogs and sandwiches. I'm convinced my guys would probably be happy with just that, but their glamper mamma of the group would be disappointed. Our meals have a balance of easy and tasty. I have five tips for new campers or campers that want to change things up a little from their typical routine. I like to prepare little foil packets dinners the first night we camp. After setting up, we can toss our foil packets on the grill and just wait for it to cook. There are lots of great ideas for doing this. We have tried barbecue chicken, potatoes and veggies. We have also done steak and potatoes. It really comes down to what you like. I recommend coating your foil with cooking spray or olive oil before placing ingredients on top. Add the ingredients to the bottom layer that need to cook the longest. Place ingredients that need less cooking time on the top. Be creative, and be sure to season each layer. Heavy duty foil helps keep things from breaking open in the cooler. Foil meal packet options. This is a favorite for me! It is easy to prepare pancake mix for breakfast ahead of time. Label a ziploc bag with the necessary wet ingredients to add to the dry pancake mix. Place the dry ingredients into the labeled bag and mix. While camping, it only take adding the wet ingredients into the bowl with the premixed dry ingredients. Easy! Pizza is another family favorite of ours. I have a recipe for a No Knead Pizza Crust. It is simply flour, salt, yeast, oil and water. I use white wheat flour or a mixture of white and wheat flour. Mix all of the dry ingredients together and place in a labeled bag. The day you want to make pizza, stir together the dry ingredients with oil and water. Let the dough sit for the next 12 hours. It can be a little less. This isn't a hard and fast rule. At the end of the day, you are ready to cook. I make our pizza in cake pans baked inside of our Dutch Oven. It is amazing! This dough makes a thick chewy crust that everyone loves. I do recommend putting some olive oil into the bottom of the cake pan before patting out the crust to top. It makes it come out a lot easier. Pizza and pancakes are both two carb options that we love for meals while camping. They are also super easy to prepare! I use a recipe for Brides Biscuits that can be frozen and used later. It is a yeast dough biscuit that can used for just biscuits but can be turned into so many other things. I use this dough to make little sausage biscuits or pigs in a blanket with cocktail sausages. This dough can be used to make cinnamon rolls also. With three options, I normally split up a batch of dough and make all three. I can freeze and pull the option of choice out of the freeze to use at home or while camping. Place your biscuits or variation into a greased cake pan. Label the foil with cooking temperature and time. Freeze. This is a great way to keep your cooler cold while traveling. The next morning, your dough is thawed and ready to cook. We cook ours in a Dutch Oven. These Bride's Biscuits are so versatile. No matter how they are prepared, they are yummy! And they freeze! From breakfast burritos to steak and eggs, left over grilled items are perfect for a morning breakfast. Preparing one extra foil packet for the grill is a great way to have leftovers for breakfast. It is my husband's favorite. You can even use leftover grilled items to make omelettes as well. When mixing with eggs or other items, your left overs can stretch pretty far and reduce and possibility of food waste. Steak and eggs for breakfast with left over potatoes and onions is my husband's favorite. I have even taken some left over artichoke dip that we brought to snack on and mixed with shredded cheese to make fun grilled cheese sandwiches. Hot dogs are another great back up meal. If you eat these on your trip, great. If not, they can always go back home to eat later. I know that I started this post by saying I didn't want to eat hot dogs at every meal. But, I never said no hot dogs. Our son loves them! So, I like to bring them along because it is an easy meal! Hot dogs with a side of nachos all prepared in the electric skillet are easy for a rainy nights at the camp site! Soup and sandwiches, or sandwiches with chips or fruit are all great meals on a trip. I just like to make sure that we have some options so that we have what we need. I also bring a big bag of fruit to keep in a bowl. We always have handy snacks and side items for a meal with fruit. Its an alternative to chips and a good way to stay on track and not just eat junk the whole time. You may be wondering if I make everything from scratch and why I don't just make canned biscuits or already prepared pizza crust. No, I don't make everything from scratch. But, I do make a lot of things from scratch. I think it tastes better. And, in the time it takes to go and purchase all of the pre-made stuff, I can make my own. I keep our pantry stocked with staple items, and it is easy to put together simple items. Plus, it is economical. However, everyone has to decide what works for their family. Pick things that you enjoy cooking and are easy. Pinterest is a great place for ideas. My Campfire Cooking Board is a place where I have saved both ideas and recipes that I have used. Also, if you would like a 3 Night Meal Plan based on these tips and ideas, select the link to open a Google Sheet that I have prepared. It has recipe links, ingredients and instructions on how to use the guide. How do you plan for your camping trip meals? Some families have special meals that they enjoy having at a camp site. Other times, I know that weather can dictate meals and meal plans. Feel free to comment and share some of your ideas about camping meals and prep. I'd love to hear what other campers enjoy doing for meals. With all of the spring weather, I'm ready for our next trip. And that means it is time to start prepping again. Have a happy week! I've seen lots of pop up camper remodels with new and updated hardware. I was fine with the hardware in our camper. We decided to just spray paint it and reuse it after painting it. However, soon after doing this, I realized our cabinet latches under the sink did not catch. They were always coming open and annoying. Our pop up camper is small, so I decided to just replace the hardware on these two cabinet pieces. The only other interior cabinet is near the door. Having matching hardware doesn't matter. It isn't right next to each other. And, having it all painted the same color does make it match. I like Oil Rubbed Bronze as a spray paint color. It has a nice dark finish. Plus, I already had a can. This can be purchased at any home improvement or hardware store. I looked online to find a catch and strike set that I could install. Since I had already spray painted the other pieces, it wouldn't really matter what color these new pieces were. I was going to paint them unless I could find some oil rubbed bronze pieces. I couldn't. I just ordered what I found with the intentions of painting. The catch and strike system that I ordered was from JR Products. JR Products 70505 Cabinet Catch and Strike These have a nice sized handle/pull to make it easy to open. Each box comes with several catch sizes to accommodate several different cabinet widths that one might have. Just match the catch to the width of your cabinet door. The strike on the door will catch on the other side to hold the doors shut to keep them from flying open. I like to spray paint down into a box so that the paint is contained into one space. Work in light even coats, and turn after each coat dries to ensure that the whole piece is covered evenly. If you want everything to match, you can spray the tops of your screws also. It is just not that important to me. I like for things to be a little mismatched. It gives an easy feel. Also after you paint, make sure that you press the strike several times in and out to make sure that it isn't glued shut from the paint. If it seems stiff, use a screw driver to make it start to move. Old hardware on the left is missing the strike on the handle. The new hardware on the right works great! I actually did this little project on our last camping trip. I just didn't have any more time to be popping our camper up and down to work. I knew that this would be a minor project. So, I spray painted one afternoon and installed the pieces the next day. I felt super happy to come home from this trip with something done that I would have otherwise had to pop up and shut everything down to do. New matching handles on each door that close properly. Touch up paint happening soon! New cabinet hardware really gives the interior a face lift. Nothing makes a space feel tired and undone like old hardware that doesn't work. Our project is a work in progress. We are learning as we go and deciding new things to do as we go along. We have loved our pop up camper. It feels so homey and comfy at the end of the day. Even though my husband has a bit of camper envy when we passes by fancy Airstreams, I love Peggy Sue. She has been such a fun project for us. What updates did you make to your pop up camper that were quick and easy? Did you install new hardware? I'd love to hear from other campers what modifications you made to make your camper your own. Half the fun of owning an older camper is the remodel and creating a customized space for camping trips. Have a great week! I love state parks. I have camped at KOA campgrounds before, but there is just something about a state park that I love. When we started this journey, my husband and I both had ideas about places we wanted to visit. Those places were almost exclusively state parks. Our most recent trip was to Buccaneer State Park in Waveland, MS. This state park was rebuilt after Hurricane Katrina 10 years ago. It is a beautiful location that is wooded and well kept. Located just a short walk to the beach, this park is the best of wooded camping and gulf views. During the summer months, campers can enjoy a water park on the grounds of the park. There are nature trails, Frisbee golf, a large play ground and a pool. This popular camping spot was quite busy even in early March before the warm weather begins. We selected a spot in the back of the park that is a bit more wooded and shady. The Treasure Cove loop, where we stayed, was recommended by the park representative on the phone. And, we felt like we did have the best spot. Our shaded spot was perfect for hanging a hammock and hanging out even it if was cloudy and cool! While there are Gulf front spots, they don't include grills or fire pits. They are also a bit longer away from the bathroom facilities. Since the weather turned off cool and rainy, having a spot near the bathrooms, fire pit and a grill were all priorities for us. The hot summer months might be nice for a Gulf spot, but the cool months would be better for a spot like ours. Also, during the summer months, shaded spots would be nice for keeping cooler in the heat. The days leading up to our trip I was frantically checking the weather. Our winter had been unseasonably warm, but we were getting a late winter/early spring cold snap. I didn't want to spend the whole time trapped in our camper during the cold and rain. There is no way to know this when booking a spot months in advance. The weather forecast was changing daily. I finally quit looking! I had big plans for this trip. Meals were planned and prepped. We wanted to go to the beach and play in the sand and take a hike. But the weather had other plans. I stocked up on Old Maid, Go Fish and puzzles to entertain us indoors. And I knew that our plans were going to have to be flexible. The day we arrived was fine. We were able to set up in dry weather. This gave us a chance to be outside and grill our foil packet dinner. But soon after we snuggled in for the night, the rain started and lasted all night. I prepped foil packets with potatoes and steak seasoned with salt, pepper and garlic for our first night's dinner. It was great! Leftovers were used for steak and eggs one morning. We were plenty warm in our camper, but are still making some rookie mistakes with our camping gear. It is a big learning curve with everything someone needs to successfully camp with no snags. The water pressure was super high and needed a pressure regulator. Our sink drained slow. We did spend a little time on a detour to Camping World for a few things to try and remedy these problems. I'm still amazed at how much goes into a camping. Tent camping is a lot easier in some regards, but our pop up camper is so much more comfortable. With comfort is also more things to do and keep up! I'm on board for the extra comfort, but we are still learning so much! Our first full day was relatively dry and cool. Since the weather was nice, we took advantage of being outdoors. We built a fire, played with legos outside and made grilled pizza with banana boats for dinner. It was a relaxing day that finished with a little puzzle fun at our table before bed. Campfires and pizza are the perfect way to end the day! No rain was in the forecast for our second day, but it did rain. We managed to make it down to the beach for a walk around and pick up some shells in spite of the weather. We had some time on the playground and walked in the misty rain. No harm there. We loved the beach even if it wasn't warm! While playing on the playground, we met a family from Texas. It was nice to swap stories and have other children for our only to play with. The mom told me that camping had totally changed their family and marriage dynamics for the better. I would agree with that. The time together and working together is great for building strong relationships. I've also had to learn to let a lot of things just go and be. I'm a planner. And when we camp, I plan all the meals and make plans in my head for activities and things to do. But mother nature had other plans for this trip, and so I had to come up with other plans. New plans. Different plans. The only schedule and plan that we were on is our own. After rain and more rain, we decided to divert from our plan of grilling fish on our last night. I knew that we were going to get rained out if we tried to use charcoal. So we opted for a candlelight hot dog dinner indoors. It was warm and fun. We also learned about another piece of camping gear on this trip. We were given an electric skillet the week before our trip and took it along with us. I was so glad that we did. An electric skillet might be the most underrated camping tool ever! I was able to plug in and cook my dinner, warm buns and make nachos in one piece! It was great. We enjoyed a short game of Go Fish before dinner. I had packed glow sticks and enjoyed them on a short walk with the dog before bed. Pure, simple fun. I enjoy everything about camping. I like the purposeful work of doing tasks that have solely to do with our what we do to just live. It is nice to take walk at the end of the day to the bath house to brush our teeth and get ready for bed. I even like the mountains of laundry that I bring home to wash at the end of a trip. It has meaning in our lives in a way that sometimes the day to day doesn't always have. Sure, going to work to provide a living for our family has meaning and purpose. My professional career is full of working hard, and this is balanced by playing hard - camping. And camping is the play hard kind of fun that love and enjoy in a tangible way. We have a year full of trips planned along with more changes to our Peggy Sue. We hope to paint and apply new decals this spring. We are cautiously approaching this task to make good decisions that we are happy with the results. Camping is more than just the physical journey of taking trips. It is a journey of learning something new about yourself and what it is needed to successfully complete daily tasks and chores away from home. It has been such a fun journey for our family. As we travel this year, I will continue to share our camping adventures on our blog. 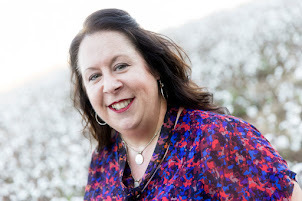 I hope you will follow along as I share our fun, and I hope it inspires you to do something fun in your own life. Happy camping! Since this first post, we were one a camping trip and a child had a bicycle accident near our camper. I ran out and handed our neighbor our first aid kit and ran back to get some damp paper towels. This organized and well stocked first aid kit made it easy for someone to find the necessary band aids and items without me being there. Our neighbor commented several times on how well stocked and organized this kit is. It is really designed to take the guess work out of finding necessities in an emergency. GREAT KIT! Beginning campers usually ask what are must haves to pack when packing. Responses usually vary from cookware and utensils to toys and games. All of these things mentioned are necessary for camping trips with families. One key thing that many families may forget is a first aid kit. Every camper should have a first aid kit. More importantly, campers should have a kit that can travel with them easily for outdoor activities. Most campers are out hiking, biking and doing a variety of activities away from their campsite. These activities may or may not be near a place where first aid items would be available. I'm not being pessimistic here but rather proactive. Having these items in a neatly organized tub or bin isn't handy when away from your campsite. Our son recently fell at school during a routine activity. It made me realize how easy to it is to be in need of band-aids and antiseptic. A few miles from our campsite, this would have been a hard trip back. Not because of something life threatening, but because it is soothing to have cuts or wounds taken care of properly. It makes us feel safe. In our camper, we have a Small First Aid Kit Best for Hiking, Backpacking, Camping, Travel, Car & Cycling. Waterproof Laminate Bags Protect Your Items! 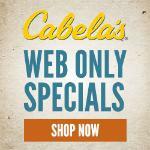 Perfect for all Outdoor Adventures or be Prepared at Home & Work . This kit from Surviveware is compact and well made. The kit is small with a zipper pound on the outside of the kit with baggies for personal medications that you might need to travel with. First, size makes a difference with every single item we pack. We are limited on space. But, this should not mean sacrificing quality of the tools we carry. This first aid kit has everything from an ace bandage and band-aids to scissors and antiseptics. It has the basic needs for travelers. A whistle in case you are solo and need to call for help. This is great if you don't have cell service but want to notify someone that you need help. An assortment of bandages for wounds as well as an ace bandage. Labels clearly state the use for each item such as pressure bandages, minor wounds, etc. 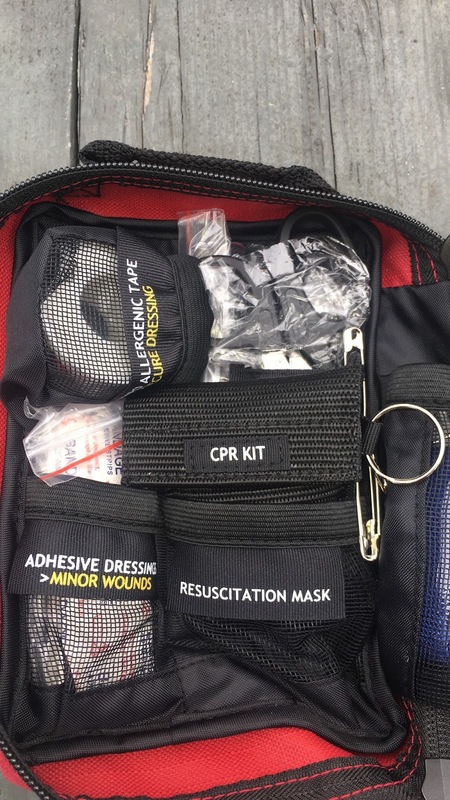 CPR Kit and Resuscitation Kit - You never know when you might need this. I hope you won't! The kit itself can attach to a bike or backpack for easy travel. It is water resistant. And, it is a light enough that the weight isn't cumbersome. One of my favorite features of this first aid kid is how the items are all organized and labeled. When needed, you can easily find what you are looking for. It is so well thought out that under stress everything is easily accessed. The inside of the kit is roomy with everything you need clearly labeled. Labels even state the use for each item to help the user clearly identify needs if necessary. Easy you and well thought out items for any type of emergency until help arrives. The Surviveware First Aid Kit that we have is also priced right. At just under $35, you have everything that you need for an emergency. Purchasing the items separately for this kit would cost well over the purchase price. And you would have to label organize and figure out how to carry and make compact. This kit just makes sense to me. Time is worth money. I would rather not spend the time figuring out what I need for my first aid kit and putting it together. I would rather purchase a kit, pack it in our camper and enjoy our trips. Purchasing a put together kit is just worth the money. If you aren't a camper, this kit is still great! It would easily fit into a glove box of a car. This kit is great for keeping in your tote bag for trips to the park with kids or on bike trips with the family. Clip it or stow it wherever you go, and you are always prepared. This kit would also make a great gift for a new camper or camping enthusiast that needs to update their equipment. Everyone needs a first aid kit. Do you have a first aid kit in your camper, car or family tote bag? If not, what do you carry in case of an emergency? Don't find yourself stranded without the right gear. 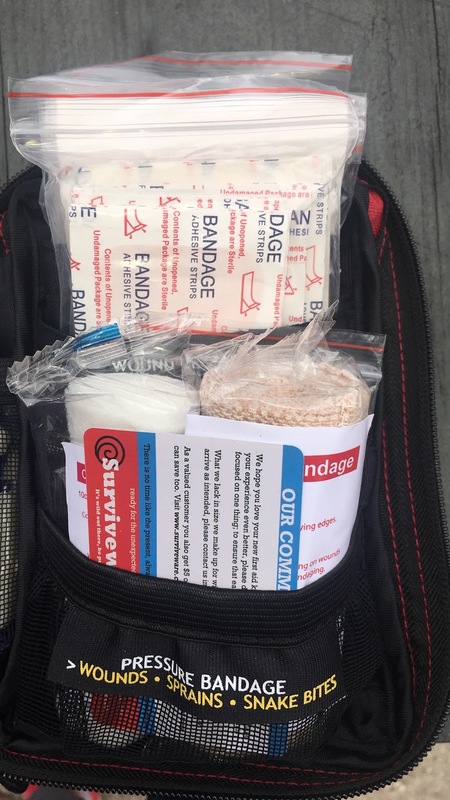 First aid kits should be first on your list of gear and essentials. Before the summer camping and vacation season starts, be sure to get one for your family. No matter what the activity is you can use one. And, if you have a kit, you could help someone who just might need you. This post contains Amazon Affiliate Links. Thanks for stopping by! We have a small pop up camper. All pop ups are relatively small in comparison to larger travel trailers. Our pop up has some but limited storage due to the size. However, we have made that work for us. When we pack up, everything goes into storage bins and containers that fit underneath the bedding that slides in over the middle of our camper. Its like fitting a jigsaw puzzle together. We make room for the waste water container that we use outdoors, our potty, a rug and several bins with bedding and other items. Expanded, it is a full size hamper. Collapsed, the bin folds flat. Putting this back into the camper once we return home is the issue. Most of the space is used already. I purchased some Space Bag BRS-6239 Vacuum Seal Clear Storage Bags, Set of 3 (Medium, Large, Extra Large) . These bags are easy and convenient to use. The Ziploc Space bags come in a variety of sizes. This makes them really easy to use! Once the laundry is done, I place everything into a bag. I place in a dryer sheet to keep everything smelling fresh. Then, I use a vacuum cleaner to remove the air and seal shut. The vacuum disk that is located on the outside of the bag can be opened. The nozzle end of a vacuum easily fits over and removes all of the air. Once compressed, everything is compact. Place the vacuum nozzle over the place here to remove air. When we camp again, the bag can be opened and linens removed for use. Because these bags can be used over and over, this is an easy storage tool. The bags slide right in on top of our other tubs once my laundry is complete. These bags are great for lots of things beyond camping. Try them for storing winter coats, quilts or other bulky items that you need to store with limited space. One other advantage to these bags is how well they are sealed. Storage bins sometimes do not have the best seal and can allow moisture, odors or little critters in them. So it is something to consider. 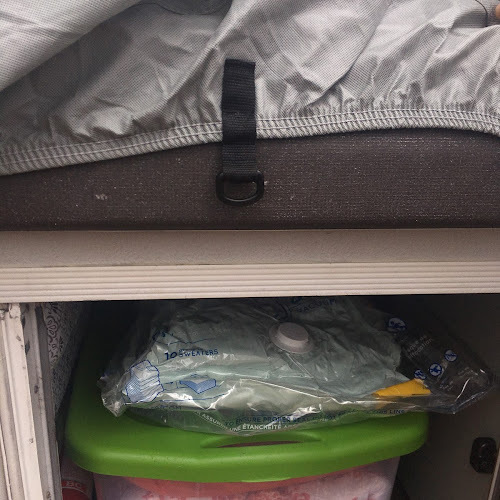 How do you store your linens and towels for your camper? What are some of your creative storage solutions? I'd love to hear how you store your necessary items for camping that make life easier.